When Acorn Media issued all 29 episodes of Poldark on DVD in the US for the first time a few months ago their very talented publicity person, Chad Campbell, made sure a copy got into the hands of the multi-talented Los Angeles Times TV critic Robert Lloyd. He wrote an insightful review of the series recommending it to anyone suffering from Downton Abbey withdrawal symptoms. It was the best critique the show has ever enjoyed. My own very talented publicity person/manager/agent/photogragher/travel companion/wife aka Meredith Wheeler, never known to miss a trick, tweeted Robert asking if he’d be interested in interviewing me when we passed through LA. He said yes and over breakfast in Larchment we spent an agreeable hour-and-a-half chatting mostly about Poldark. I mentioned that Robert is multi-talented and it’s true. He spent years as a rock musician before settling down with his family in LA. We discovered during our chat that we were both dedicated Grateful Dead heads–putting a date on us! He promised to e-mail me links to some lesser known Dead recordings–which now we are back home and rested, I’m enjoying. Just in case there are other DGDHs out there…! Thanks Mary–good to hear from you. A plate of cold roast lamb with a spicy sauce for dinner tonight! An interesting interview. I’m not surprised that mothers named their little girls “Demelza.” At the time, I had a high-waisted print maxi-dress that my mother and I called my “Demelza” dress. I wore it for special occasions. I always hoped I looked as pretty as Anghared Rees (I doubt it!). Oh, how I loved that dress. I love the two photos with the article — similar head positions — or should I say similar Dead-head positions? Keep on truckin’ . . . would love to see you play Dr Who . . . maybe Meredith has their number? 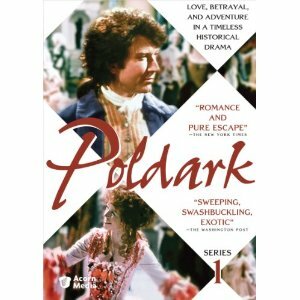 “Poldark” came to me in later life (72), and I’m a dedicated fan. We plan a trip to England to include Cornwall (mother’s family immigrated from there). Can you possibly tell me of some places in Cornwall not to miss? Especially Poldark related. Leila–Cornwall is beautiful and with family connections to follow up you will love it. We filmed in so many places it’s hard to remember. To get a feel for how it was in those Poldark days, go t’ards Lands End from St.Ives along the north coast. The house used for the front of Nampara is along there at a place called Pendeen I think. We love Brittish mysteries, comedies etc and one day I found Poldark on Netflix. We were hooked. We couldn’t wait until another DVD arrived. I am now buying the complete set on Amazon. The only thing worried me was that you would go back to Elizabeth. Demelza was the one that really loved you. Great Job. flavor named after you. Well, maybe a sugar-free sorbet. It’s no effort to speak well of Poldark–I hold it close. What it is that make Ross Poldark so attractive? He is someone who leads and takes risks (as per you) and is portrayed by very ATTRACTIVE Robin Ellis (as per all people’s consciousness). By the way…what names Angharad Rees gave to her twins? on April 10, 2012 at 10:12 pm | Reply Dianne P.
“Old Krap”?! Boy, did HE get that wrong, haha! Tried to find “Bel Ami” on EBay-UK…no luck (except for some eye-opening beekcake pictures under that name!) Is it available somewhere? Perhaps you can tell us where to find some of your other works, sometime…? I’ve started reading “The Waterfall” after a colleague recommended it–is your movie version available somewhere? I used to queue for the latest Beatles LP on the first day of issue way back in “62/’63? They don’t date either. We flew home in the car from Italy once listening to them! Bel Ami never made it to DVD and I don’t know about the Waterfall. Reading the books might be a better idea!! on April 11, 2012 at 11:16 am Dianne P.
Had to ask about the Beatles! Gene loves the early Btles. too. I love ’em at all stages.) Music, esp. 60s/early 70s music, is a topic near & dear to my heart…I used to be a disc jockey at an oldies station, and just couldn’t understand how someone would actually PAY me to play the music I loved!! Thanks for answering my Q.
what a great interview 🙂 It must be so heartwarming to know that you have created work (and new work in your books) that will continue to be enjoyed again and again by new generations. I really admire that. on April 11, 2012 at 7:16 am | Reply Caroline P.
Hi Robin,Just finished reading the interview in L.A. Times. In the last question you mentioned that Poldark is attractive because he leads and…takes risks because not everybody is prepared to do that. And I fully agree with that. My husband Peter always says to me when I hesitate to do something ……….”Take a risk …do like Robin-(you were a bit frightened to ride on horseback but at the audition ) but you said: yes I can riding on horse back! That’s a great lesson for life! Thanks a lot! I agree with the risk taking. I married a guy who never seems to take the well worn path. Medical practice inMontana’s Indian Health Service instead of a cushy practice, then off to the same in Alaska, retiring in a lousy economy at age 55 to become a wanderer–doing temporary practice in New Zealand, New Mexico, Minnesota, and medical mission trips to India and Tanzania. We never know what’s coming next, but life is never boring. Here’s to risk taking! @Hedvika.Should not have ask the question about names…googled the sad response to it. love Poldark & all who sailed in her!. Do you have any ideas where I could obtain a Poldark poster? I don’t even know that was a poster–it was made in the days before TV did much self-promotion.